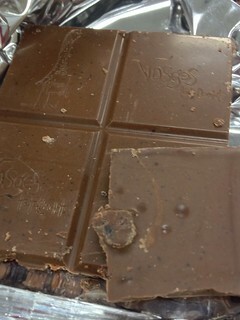 Vosges was one of the first high-end chocolate brands that I tried. Since then, I've found other brands that I like more (and often cost less) but I'm always up for a new Vosges bar. They offer some unique combinations, and African Red Tea & Tart Cherry is something I haven't seen before. It's been a few years since I've been to Las Vegas, but the Vosges boutique in the Forum Shops at Caesar's Palace is one of my favorite stops. There are always new truffles, sometimes assortments go on sale, and they usually have several chocolates to sample. Plus, the purple/white decor is pretty. The chocolate was quite pretty! It was light in color (at 45% cocoa) with little black flecks in it (probably the tea). It smelled more bitter than it actually was and I'm guessing that was from the tea, because it had an earthy scent, too. The chocolate was soft, creamy, and milky (little to no bitterness). It had a slight stickiness and it was sweet, but never what I'd call too sweet. The tea gave the bar a bit of a strange, gritty crunch. 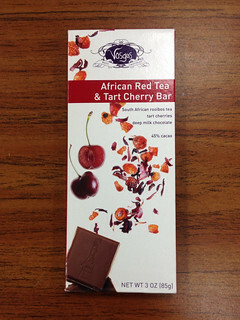 The cherry bits were tart indeed and went well with the sweet chocolate. They also added a soft, chewy texture to the mix. Speaking of chewing, the red tea bits were quite tart when chewed as well. Overall it was an interesting bar, but I probably wouldn't get it again.